Fernie Adame is giving thanks on so many levels this Thanksgiving. He was diagnosed with skin cancer last year and can happily say he has beaten it and is cancer-free today. In addition to that, he has successfully moved his Sola business from Albuquerque to Las Vegas, a risk many salon owners wouldn’t have the guts to take! He’s still operating on a part time basis in ABQ, too, visiting when it’s time to catch up with his clientele. Business is booming, thanks to a clever social media strategy he'd like to share with the Sola community. Before you talk about your Sola or business, can we touch on how you’ve spent this past year battling cancer? After I got back from the Faces of Sola photo shoot last October, I got back and was diagnosed with sarcoma, a form of skin cancer. My oncologist placed me on chemo and that really took me out of the studio for most of the holiday season. I didn’t take on any new clients between the months of November-February, and my only motivation that kept me going were those close relationships that I had established and grown with my existing clientele. They understood what I was going through and they were really flexible. Every day, when I would wake up in the morning, I would walk into my studio and immediately stop thinking that I had cancer and that I was going through chemotherapy. Being there and working on my clients allowed and helped to forget what my condition was. They helped me get through all my treatments. Was it their presence that helped you or did they help you more specifically? The beauty of this was how they all work in different industries—some are professionals who work in the medical field or the legal field. They would provide me with positive feedback, answer questions, and act almost as a sounding board for me when I needed it. Because you weren’t taking on any new clients, and probably weren’t in out in the studio as much, did you take much of a financial hit? I did, and it’s because I’ve always been very goal-driven. I’m also a big numbers person, and that has a lot to do with my previous career in retail management. I look at the numbers, try to spot trends and go through the history. I look at the amount and type of services I deliver in one month and then compare it to what I did that exact month a year prior. When I was going through chemo, I did take a big hit, but what helped me through this obstacle was the property manager Rosie and her husband were very flexible with me. I shared with them what was happening and that I had cancer and had to go through chemo so that I didn’t lose my lease. How were you able to make sure you didn’t lose your lease, and even more, what about the financial impact this took on your personal life? I had to be strategic and plan better, not just with my business, but also at home. I had to make sure I had bills paid 45-days in advance. This made sure that if I couldn’t pay bills for a month then at least I had some room to work with and that I was ahead. I had to be very big picture. And through all this, did you have health insurance? I did, and I shopped around for quite a while until I did find one. That is one of the struggles of being a business owner and not working for a salon or for a corporation. I find the best solution and co-pay through United Healthcare. A lot of medical centers offer different resources and aid. I don’t think a lot of people utilize or understand that. I was able to receive a lot of guidance just through asking for it. For instance, I had one organization that offered to pay a couple months of my car payment if I needed. It is really nice to know that this kind of help and aid is out there. It’s safe to say that not a lot of salon pros know that this kind of help is out there, and it’s probably exceptionally important for our Sola community to know this, so can you share how you went about finding this type of aid? During my doctor visits, they would have me meet with case management. At first, I was like, “What the heck is case management, anyways!” These case managers don’t want us, the patients, to stress about life and day-to-day issues. They want us to focus on healing. Finding this type of information isn’t just something that I Googled; I discovered it through the medical center and being open to learning and understanding more. “Case Manager” kind of sounds a bit scary, like you’re in trouble if someone says, “You need to speak to case manager!” But in hindsight, they are problem solvers and solutions providers. Do you think for the salon pros out there who are either undergoing or who have endured medical obstacles, who may have outstanding debts, still have an opportunity to go this route? Oh, I’m great! I didn’t have to do all eight rounds of chemo treatments. After a great MRI, my oncologist cleared me. After I was able to beat it, I decided to move out of state. I was in New Mexico, and moved to Nevada and open up this Sola location. So your Las Vegas location is officially open then? Yes, I opened it up and I’ve been working on building my business there. I’ve been working on establishing a clientele, increasing the visibility of my studio and business. I am still transitioning between two locations because I still have my space in New Mexico and visit part time. I should also add that I do have a studio partner in the Las Vegas location. Oh, so you share your space with another person? I do, actually. Her name is Kenia Lopez and she was at a Sola located in New Mexico and that’s where we actually met. So when I came to Las Vegas, we reconnected because she also moved out here and we decided to share a space. This is my first time sharing a space with someone. I’ve never had a business partner before and it’s nice to know I have someone in the room with me. Kenia has been in the industry for 10 years now. She is a colorist and a great hairdresser. 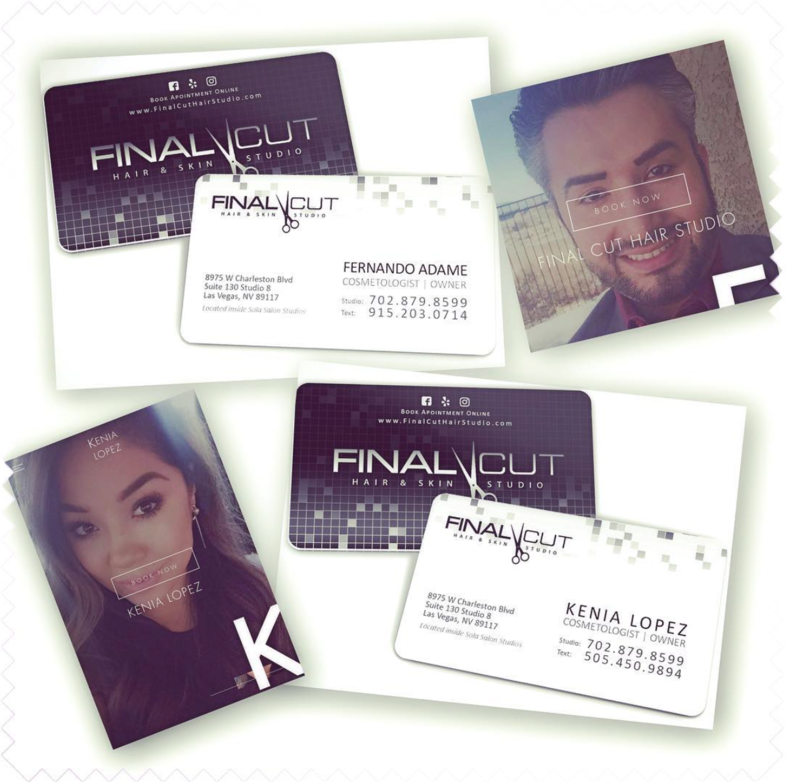 Even though I am Paul Mitchell trained, Kenia brings her education and knowledge of other manufacturers. This helps me gain and grow my knowledge and I’m grateful for that opportunity. Let’s touch on some of those business-building tactics that you’re using to establish and build your Las Vegas location. Most importantly, I’ve made sure that it has a digital presence. That is so important! In my time, years ago, everything involved the Yellow Pages. That’s what I grew up on. If you needed a garage door or a water heater replaced, you had to flip through pages and look for a coupon and a contact. Those days are so over. Having a website is so important. A website is the backbone. It is like the octopus and then everything else is its legs. Clients have their favorite platforms and apps; Twitter, Instagram, even Pinterest. And when you create these different accounts on these platforms, you’re asked to place a link. Having a website and a URL to place there is what helps your business. I’ve had a website now for three years. I work with a webmaster and utilize a marketing package. Every 30-45 days, I go in and I update the Search Engine Optimization (SEO) to capture new clients. If Mother’s Day is approaching, I go in beforehand and plug in certain keywords to attract certain search results. 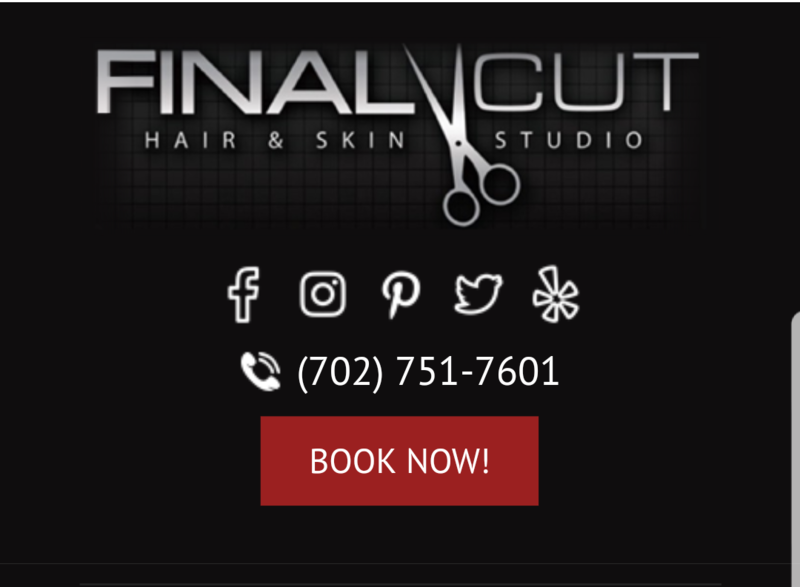 Some of the keywords I’m using today are “27/7 booking,” and “balayage specialist in Sin City.” A keyword that people use like “salon near me” and “prom hair” get entered in, my salon comes up in the search results, and then I make it so they have a website to view and a direct link to book an appointment online with me on SolaGenius. This is a great way I’ve built my business. Along with that, I do a lot of follow-up with new clients. It’s about building that hair relationship with them. It is so important for them to receive this. It can be an email that gets sent after their service, one that also has all the links on how your client can also follow you and connect with you. That email can also encourage them to write a Yelp review for you. Provide them with communication with hyperlinks that make it easy for them to access and follow you is so important. You mentioned giving new clients an opportunity to book with you online. Are you using SolaGenius? I am, and I was actually one of the people who was invited into the test group. What I really like is the “White Glove Service” that Sola professionals get. When a client pays and leaves my studio, the app is texting and alerting me reminders about it. It knows that I’m moving onto the next person or I’m done for the day and it is helping to remind me to perform certain tasks after the fact. For instance, after Rhonda leaves my studio, the app messages me asking me if there are any notes I’d like to enter for Rhonda. It creates this opportunity for me to say that Rhonda was a retouch with foils and that she had her dog at the vet and is going to Florida on vacation. Now either a day or two before Rhonda’s next appointment, I get a notification that tells me everything we did and discussed at Rhonda’s last appointment so I can pick up right where I left off. It helps create this higher level of customer service. How are you building your business and digital presence through social media? Being present on Instagram is a priority for me. Kenia and I have a three-minute rule when it comes to social media. We take a neighboring business that’s next to the studio and three times a day we “like” or “comment” on people’s posts who have tagged that neighboring business as a location. To do this, you click “Search” and then click “Places” and look at the neighboring businesses around you. When you click on one, let’s say P.F. Chang, then you spend a full minute liking everyone who has tagged that business and that location in their Instagram post. Then those people’s picture just liked will come and look at who just liked them. They will then see all your pictures on your Instagram page and see what kind of services you have to offer. We do this in the morning, right after lunch and then at the end of the day, after dinner, before bedtime. What are your strengths as a business owner? Those would be #1) I believe in a manufacturer, the Paul Mitchell brand, and I have mirrored my own brand around that. If you look at my logo, you’ll see that it is black and white, just like the Paul Mitchell brand. Even in my salon décor. It’s a lot of black, white, and grey, much like Paul Mitchell. If you support that brand, the brand will support you. One thing people should do more is making sure that the manufacturer knows about you. 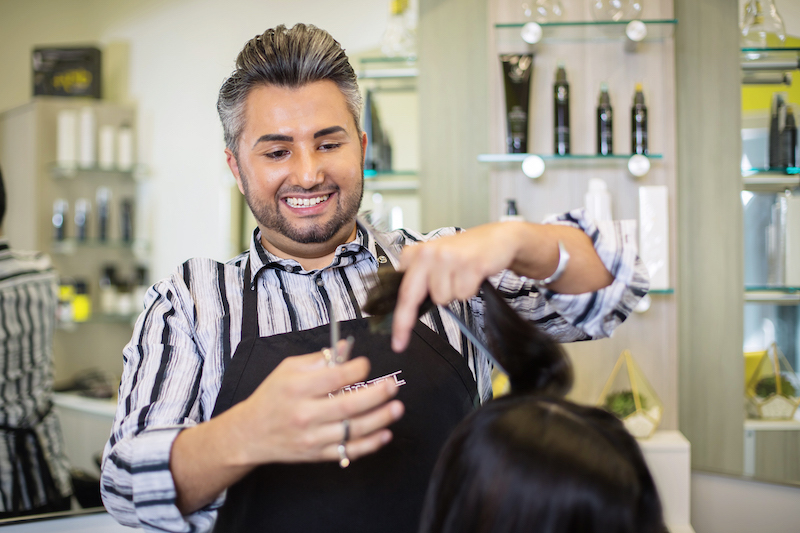 Make sure you’re listed in THEIR salon finder. Side note, that’s also another keyword to remember—the manufacturer name. 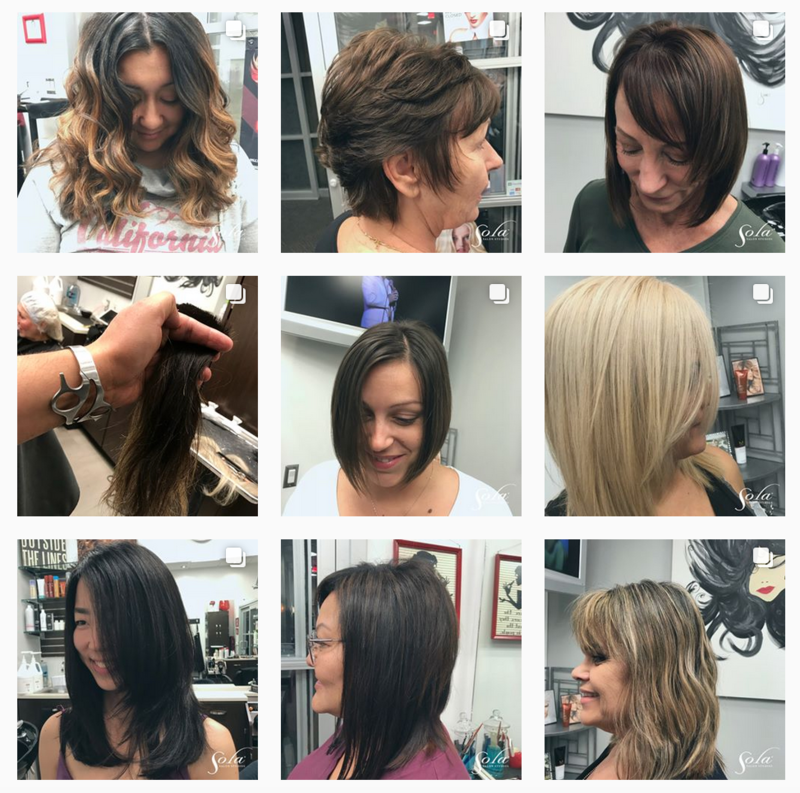 I have as one of mine “Paul Mitchell salon near me” and Final Cut Hair Studio comes right up. #2) I have established what I am known for. I am a true colorist and that’s what people know what I do. #3) I STRONGLY believe in retail. From the second you sit in my chair, or you’re sitting at the shampoo bowl, every single product that touches you is sitting on the shelf or on the station in front of you. It’s important to me to create an experience around product. How has Sola helped advance your career and your business? Sola has given me the ability to write my ticket to wherever I want to go because they have over 350 locations. Because you develop a good relationship with your property manager, you have an opportunity to expand into other Sola locations and operate in multiple cities. I have my space in New Mexico and now I have one in Las Vegas. And due to flexibility and being the owner of your four walls, I only have to worry about what’s happening inside those walls. I don’t have to worry about the building like I would if I was outside of Sola. Headaches like the air conditioning breaking or having to resurface a parking lot. I have freedom and my freedom is to deliver my art as a hairdresser. To watch a video about Fernie, click here! For more info, visit his Sola webpage, or connect with him on Instagram.